Division 4 is loaded this year, as SPM and Tyis Boykin (pictured) attempt to knock off favorites Doherty and Shepherd Hill. This week's edition of our Power Rankings is extra special because we get to break down the playoff brackets for each CMass division. But, let's not get ahead of ourselves, here are our final Power Rankings of the regular season. 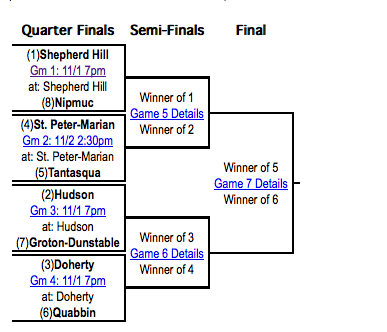 Playoff previews for all four CMass brackets after the jump. 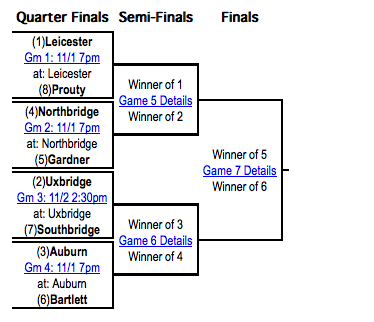 Editor's Note: There appears to be some hangup with the scheduling of the St. John's-North Middlesex game in Division 2, but all other game dates and times are now posted in the brackets below. Division 2 looks to be as competitive a division as there is state-wide, but in Central Mass, Leominster has established itself as the clear-cut favorite. Behind the stellar play of senior quarterback Neil O'Connor, and the combined efforts of versatile athletes Jarell Addo, Mayson Williams and Jake Allain, the Blue Devils have become one of the state's most unstoppable offenses. Defensively, O'Connor teams with Addo to form one of the state's best safety duos, and the speedy three-man front has created problems for each team Leominster has faced. The Blue Devils have defeated every team on their schedule by double digits, including St. John's, Doherty, Shepherd Hill, Shrewsbury and state ranked Lowell. Leominster has ambitions, not just of a Central Mass title, but a state crown as well. It really speak to just how dominant Leominster has been to say that you "shouldn't sleep on" the Pioneers. The St. John's offense, led by All State quarterback Andrew Smiley, is as lethal as ever, and the defense is actually improved from a year ago. St. John's is coming off a momentum building win over Marlborough, and receivers Michael McGillicuddy and Davon Jones force defenses to pick their poison. Even if you can cover that tandem up, Smiley has begun making teams pay on the ground in recent weeks, and junior running back Shane Combs has run hard to keep the chains moving. Shrewsbury had a ton of holes to fill this year, primarily on offense, and the running of Diliberto has helped the Colonials do that as the season has progressed. 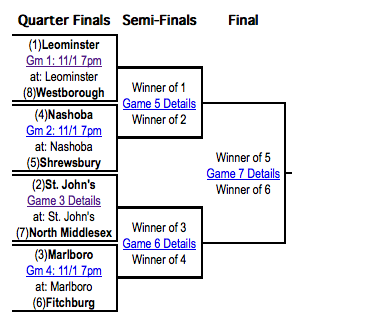 As Diliberto goes, so goes the Shrewsbury offense, and if the Colonials want any chance of upsetting Nashoba in the first round, they'll need a big game from their senior leader. Doherty may have the best wide receiver duo in the state in BC commit Isaac Yiadom and 6-foot-4 "don't cover him one-on-one in the red zone" target Alfred Adarkwah. The Rams, meanwhile, may have the toughest backfield in the region, with Drew Jean-Guillaume and Jake Gelb running through defenses in Shepherd Hill's double wing attack. Both teams have only one, forgivable, loss (Leominster), and each has already defeated SPM, though only by a single point. If one of them can emerge from CMass, a state title in D4 is certainly within reach. Let me say this: Division 4 is going to be crazy. SPM lost to Doherty and SH by a combined two points, and Hudson, though beaten up, has knocked off everybody in their path. The Hawks haven't had a marquee win since they opened the year with a beat down of perennial power Auburn, but all they do is win. Doherty and SPM's receivers, along with SH's backs will get their due attention, but I'd keep my eye on the kid that is rewriting the CMass record books every week. Kierman has thrown for nearly 2,100 yards and 23 TDs in only seven games, and has added another 430 yards and 7 TDs on the ground. It will take a monster effort from Kierman to knock off high-powered Doherty, but if any one player can do it, he's the guy. Man-child Tom Rodrick, a UConn commit, is the most dominating defensive player in the region and, perhaps, the entire state. His sideline-to-sideline speed and powerful hits make teams think twice about running the ball on the Wolverines, and he's also the most physical runner in CMass on offense. Speaking of offense, quarterback Drew Mazzeo's return from injury has made the Wolverine attack even more explosive, and Shane Padeni's hard running and break away speed have served as the perfect compliment to Rodrick on the ground. The Wolverines already have a convincing win over Auburn under their belt, but…. Never count the Rockets out, at least not as long as coach Jeff Cormier is on the sidelines in Auburn. The Rockets had to replace 10 starters on both sides of the ball (Only two-way lineman Will Greelish returned from last season's Super Bowl team), and are the classic example of a team that will improve every week. Freshman quarterback Steve Saucier is the future of this program, but a late-season switch to senior Adam Gustafson has paid dividends, with the elder signal caller providing a stabilizing presence in the backfield. HIs game-winning 43-yard touchdown pass last week at Holy Name has Auburn feeling good about their chances against anybody in Division 5. Northbridge is convinced its found its quarterback of the future in this dual-threat sophomore, and his play the last four games seems to confirm that. Schofer has beaten teams with both his arm and his legs, to the tune of 615 yards and 5 TDs through the air, along with 640 yards and 10 TDs on the ground. The Rams are the hottest team in Division 5, but will only go as far as this talented youngster can take them. No team has dominated its schedule quite like BVT. The Beavers rolled through the Colonial undefeated, and beat opponents by an average of nearly 30 points per game. Senior quarterback Nic Wojnar and running back Ben Reiffarth form one of the most formidable backfield in Central Mass, and the defense has been immovable, particularly against the run. Littleton, meanwhile, opened the season with a six-point win over West Boylston, and hasn't been challenged since. Quarterback Alex McLaughlin broke out with a 213 yard, 4 TDs rushing, and one passing TD performance in a shootout win over St. Bernard's. The defense, while not as lauded, has been impressive as well, holding opponents to 20 points or less in five of the Tigers' seven wins. The Lions scored a huge win over Leicester a few weeks ago, and are another reason why D6 will be incredibly entertaining. Quarterback Alex Thomas has come on strong of late, helping the Lions average over 42 points per game offensively. A defense led by senior linebacker Bryan Hayes just pitched a shutout at Murdock, and has been playing lights out since giving up 20 to Leicester (In a 28 point win) on October 11th. Wojnar has not only made the BVT offense unstoppable as both a runner and a passer, he also leads Central Mass with 74.5 tackles. Wojnar has always been a leader for the Beavers, so his move to QB surprised virtually no one in the area. 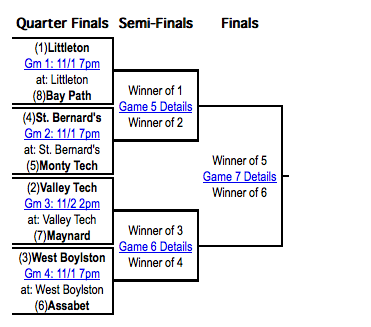 BVT's schedule hasn't exactly been murderers' row, but Wojnar is legitimately one of the best players in the region.